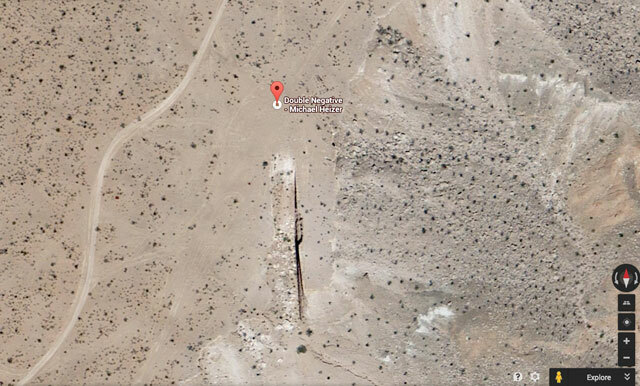 Earlier today @museumnerd tweeted out a link to a view of Michael Heizer’s land work “Double Negative” (1969) in Google Earth. Viewed in satellite, from high above, Heizer’s 1,500-foot-long trenches looks almost incidental, like cuts made with scissors into the skin of the earth. It’s an incredible — and incredibly different — way to view a work that, until the invention of online maps and the proliferation of satellite imagery, would mostly be viewed on foot (if at all). Surely anyone who had the hubris to carve that kind of mark into the land envisioned it being seen from above, but he might not have imagined the process of doing so would become so casual. Looking at “Double Negative” this way set me off on a quest to find other land works in satellite. It turns out someone’s already done some of the work and made a “Land Art of the West” Google Map, while the Museum of Contemporary Art, Los Angeles, took up the idea for its 2012 exhibition Ends of the Earth, although many of the artworks listed there were temporary, meaning their maps are now mundane monuments to what once was. An artist named Don Seeley has devoted a section of his website to “Monumental Land Art,” which is a wonderful aid for Google Maps explorers. 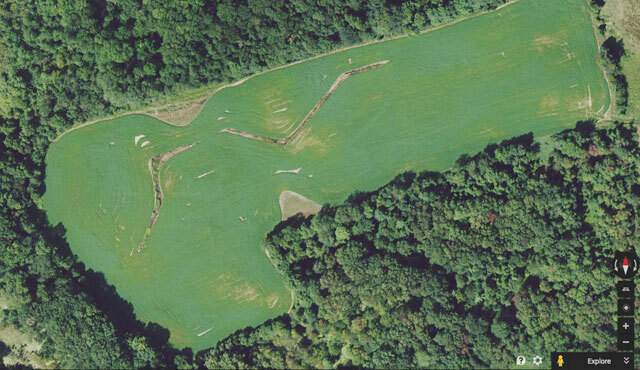 And there’s a Google Earth Tour of geoglyphs around the world by Andrew Rogers. Still, I found myself returning to North America, probably because it’s the terrain I’m most familiar with. 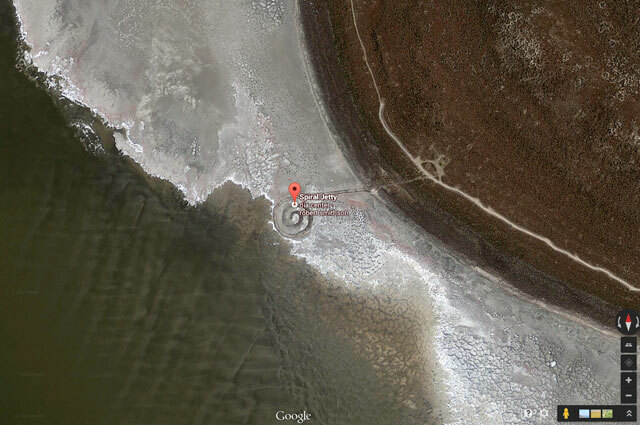 And perhaps predictably, some of the most famous projects are also the most stunning, including Robert Smithson’s “Spiral Jetty” (1970) in Utah, which, from the bird’s-eye vantage, looks like a cryptic signal sent from our civilization to some future one. And then there’s James Turrell’s ongoing transformation of an extinct volcanic cylinder cone, “Roden Crater” (1979–) in Arizona. Honestly, the crater itself is stunning, without any need for help from Turrell; in the Google satellite image, it looks like an abstract painting, the rusty red of its center giving way to a white wash of brush marks and steel blue. Meanwhile, Richard Serra’s “Shift” (1972) in Canada looks like a strange lost form of writing, the hashing out of a kind of code into a brilliant green field. 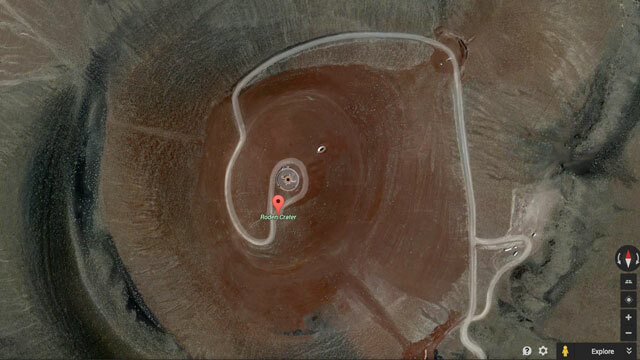 And Walter De Maria’s “Lightning Field” (1977) in New Mexico looks like a smattering of ants gathered around an anthill. is barely visible, lost in a plain of heavy earth accentuated by black dots that look like swarms of ants. As everyone who’s done this knows, there’s an inherent strangeness in using technology to view these artworks, which are so deeply embedded in the idea and physicality of place, from the comfort of my Brooklyn office, Google Maps’ navigation tools waiting at the ready. On the one hand, it’s quite literally awesome; on the other, it inspires profound uncertainty — to see layer upon layer of human engagement with the Earth, technological prowess overlaid with artistic, and to think about the unrelenting human tendency to shape the planet to our will. 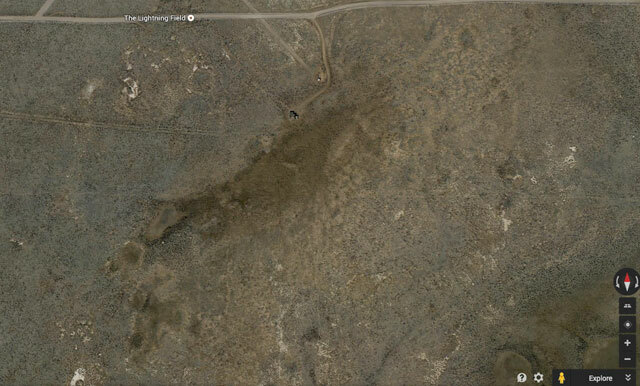 Editorial note: The previous image of Walter De Maria’s “Lightning Field” was incorrect. It has been updated, thanks to commenters.